Glance at Clay Buchholz’s ERAs over the 2008-2010 seasons, and you’ll be inclined to believe that the former phenom’s major league performance has progressed from ghastly (6.75) to good (4.21) to great (2.52). That’s a compelling narrative — the hot-shot prospect tosses a no-no during a September ’07 call-up, gets his head handed to him the following year and then makes the necessary adjustments to blossom into a full-fledged ace. It’s a nice story. But it’s also misleading. In truth, Buchholz neither fell to the depths of despair that his ’08 ERA suggests, nor has he risen from the ashes like a phoenix this season for a Boston rotation suffering greatly from injury and underachievement. Throughout his big league tenure, Buchholz has been pretty good, but hardly elite. In 2010, Buchholz has 5.72 K/9, 3.78 BB/9, a 51.5 percent ground ball rate and a 4.33 xFIP in 78.2 frames. For comparison, his xFIP was 4.28 in ’08 and 4.09 last season. The big change in Clay’s ERA is due to factors largely out of his control — his BABIP is .268 (.302 career average) and his home run per fly ball rate is just 4.2%. His career rate is 11%, right at the big league average. Buchholz has thrown just 43.8 percent of his pitches within the zone this year (47.3% MLB average). Batters have gone after his out-of zone pitches 31.5% (28.1% MLB average). However, they have put the bat on the ball 67.6% (66.4% MLB average). That’s a sizeable increase from the previous two seasons — in 2008 and 2009, hitters made contact with Buchholz’s out-of-zone pitches at a rate that was about seven percent below the major league average. This season, they’re making contact on those pitches at a clip that’s two percent above the MLB norm. (note: the numbers are rounded, so not all columns add up to exactly 100). 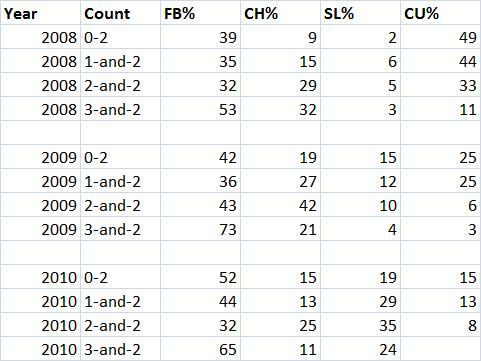 These changes in Buchholz’s approach help explain why he hasn’t missed as many bats as expected. His minor league K rates suffered over this period as well. Buchholz spent much of 2007 pitching between Double-A Portland and Triple-A Pawtucket, and he logged a good number of innings with the PawSox in ’08 and ’09. Buchholz’s major league equivalent K rates declined over the years — According to Minor League Splits, Buchholz’s work in the minors in 2007 translated to 9.8 K/9 in the big leagues, but that mark fell to 7.7 K/9 in 2008 and 6.7 K/9 in 2009. Clay Buchholz has a fantastic minor league track record. He exhibits strong ground ball tendencies, and he was an elite strikeout pitcher during most of his days as a prospect. It wouldn’t be surprising if he took significant steps forward in the coming years. But the current version of Buchholz is more of a solid, low-four’s ERA-type than any sort of rotation messiah. We hoped you liked reading A Buchholz Breakout? by David Golebiewski! Are you really trying to make the argument that a .268 BABIP is unsustainable for a guy with a 51.5% ground ball rate? Really? With an infield as defensively good as the Red Sox? xFip is a terribly misleading stat for high ground ball guys.